Studies show that 71% of the US labor force is actively seeking or open to new a job, over 65% of American workers switch jobs every 1-5 years, and of those that stay, almost all employees want a promotion or raise. Taking a Coursera course is not only a way to learn a new skill; it’s also a great way to show that you’re self-motivated, knowledgeable, and intellectually curious. To properly showcase these characteristics, it’s essential to find exactly the right course to signal your aptitude and abilities to employers–for now and for the future. With more than 700 courses offered across 25+ categories, the options seem endless, and making a choice can be tough. Choosing the right course specifically for professional development can be even more challenging not only because of the sheer number of options, but also because of the distinct nature of individual courses. If professional development is your aim, when faced with this choice, it’s helpful to think about courses through the lenses of professional goals and skills. Understanding and clarifying your career goals will help you in the decision-making process. Ask yourself: How do you want advance your career? If you’re looking for a career change… consider joining a Specialization, which is an extended, focused program that will leave you well-prepared to seek out a new job. If you are seeking a promotion or a raise… find a course that builds on your existing abilities, or a course that introduces you to a new field altogether. With your new competencies, you’ll be much better equipped to seek out that promotion or raise. If you are preparing for a job interview… look for courses that allow you to refresh your knowledge of relevant subject areas and give you a good grip on technical details that may come up in questions. If you are running or starting your own business… consider courses that will help you develop new core competencies, as an entrepreneur must be talented in many different areas. Might this course help position me to change careers? Will this course reinforce the knowledge I have for my current job? Might this course lead to a promotion or a step up the ladder? If in an interview, will I be asked questions related to this topic? If running your own business, will it add to or complement what you need for growing your firm? Now that you’ve narrowed in on your professional goal, think about the skills to obtain or develop to attain the goal. If you know what eventual end result you want in your career, you can properly hone in on the courses that will teach you the skills you need. We host top-tier courses from the world’s best universities and educational institutions–many of which can help you reach your professional goals. Focus on skills that shows employers that you are ready for new challenges and responsibilities in the field. If you are looking to develop…. Business acumen: finance, accounting and economics, operations, etc. Technical expertise: programming, data science, information security, etc. Leadership skills: entrepreneurship, strategic thinking, etc. Teaching skills: Common Core, K-12, etc. Language proficiency: writing skills, reading, etc. Legal expertise: legal philosophy, constitutional concepts, etc. 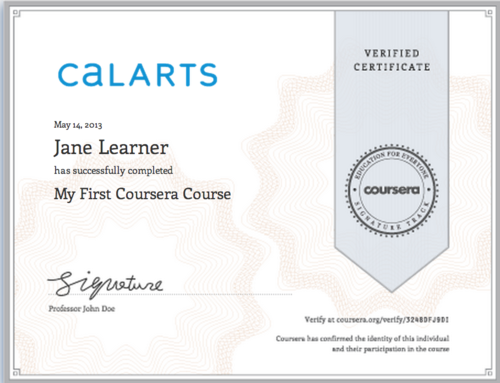 …and beyond, Coursera is your ultimate learning resource. Verified Certificates, or if it is part of a Specialization. Specializations, a sequence of 3 – 8 curated courses, prove expertise because you gain a unique depth of topic knowledge. Specializations culminate in a Capstone Project, a practical and industry-relevant project, that is a demonstrable indicator of your knowledge. Employers value these certificates because it proves and signals acumen. During the course, see if you can create or add to your professional portfolio, as well (including completed assignments, Capstone Projects, etc.) So before clicking the “Join for Free” button, consider if this course will tangibly show employers and colleagues you’ve learned the topic by earning a Verified Certificate. Once you understand what your professional goals are, as well as the skills you want to cultivate, you’re on the right track to finding a course that fits your needs. We want to hear from you, and allow other Courserians to learn from your experience!